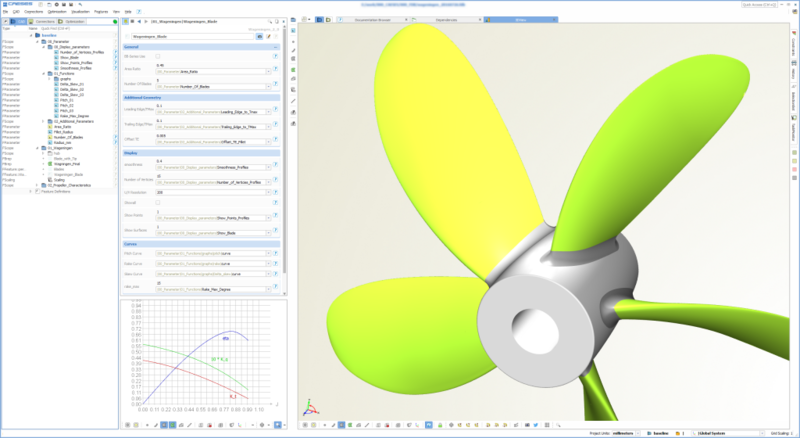 CAESES® is used by several customers for the design and automated shape optimization of marine propellers. Besides comprehensive methods to design parametric 2D profiles and efficient 3D models, any external software package can be coupled and integrated into the GUI of CAESES®. In this case study, FRIENDSHIP SYSTEMS prepared an example for linking CAESES® to OpenFOAM for a workshop that was held in October 2014. The following summary is also available as CAESES® tutorial that gets shipped with the installer. The blade is generated by using the “Generic Blade” type of CAESES®. One can choose between standard profiles such as a NACA series or a B-Series (Wageningen). The blade modeling concept also allows users to define custom 2D profile descriptions, as well as radial distributions for each custom profile parameter. A set of design variables is then linked to these distributions (e.g. 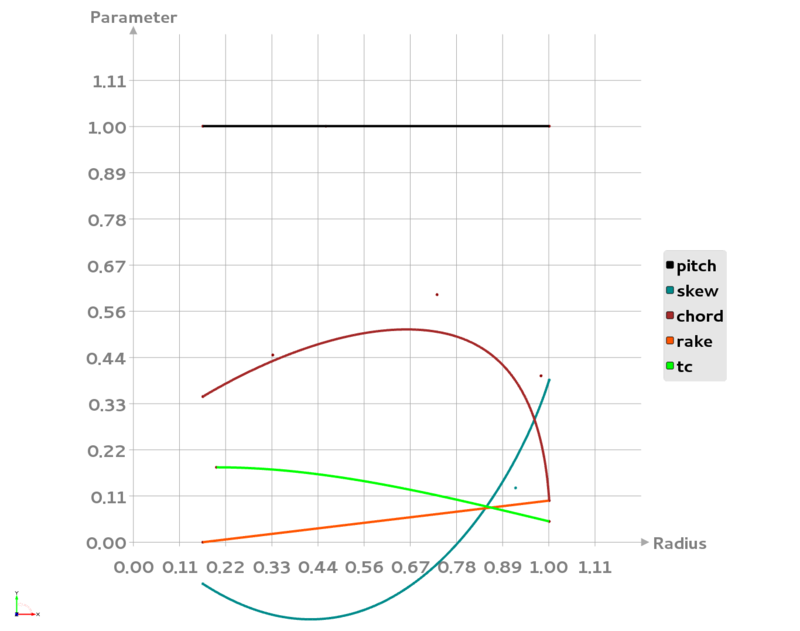 to the chord, rake, pitch and skew distributions). These variables are then modified automatically by means of design engines (variation and optimization algorithms) in a next step. For a smooth tip, there is a dedicated tip feature in CAESES®. 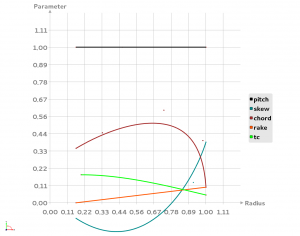 For more information, see this blog post about propeller tip modeling. In order to plug-in OpenFOAM into CAESES®, a software connector is used. Within the GUI of CAESES®, the user can then simply drag & drop the geometry into the export section of the connector, for exporting the blade in a multi-body (colored) STL format. With this specific STL format, colors help to group together different parts and boundary definitions. In addition, during a variation these groups will contain the same surfaces since the colors are fixed. This allows users to set up this process only once, and run fully-automated studies without any pre-processing. Results files of OpenFOAM (forces.dat, cases.foam) are also specified in the software connector. Values from the ASCII file are automatically extracted and loaded into CAESES®, to make use of them for automated design studies and shape optimization. Finally, interactive 3D post-processing and different plots are available in CAESES® by using the case.foam file. Running OpenFOAM within CAESES® is simply done by means of a “computation” object that triggers the Allrun script with a single click: Then, a geometry variant gets exported, meshing is triggered (using the meshing tool of choice), CFD is started and results are pushed back into CAESES®. This process is fully automated. Check out the video (CAESES as a GUI for OpenFOAM) in our video section. There is also a nice blog post (blade analysis for propellers) which shows how to quickly generate a fully-parametric blade model from a set of given NURBS surfaces (for blade designers). 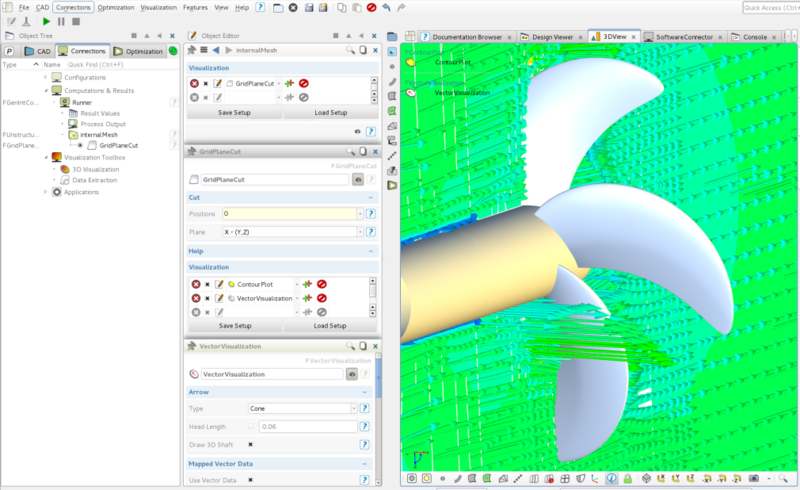 Another blog post about a Wageningen B-Series propeller comes with a short video that shows how to quickly generate these specific propeller geometries including a link to online propeller tools. If you have further questions about coupling CAESES® and OpenFOAM, please drop us a line, or take a look into the CAESES® forum where plenty of posts deal with this topic (just enter e.g. “OpenFOAM” into the search field). For instance, see this detailed description about running the Ahmed Body using OpenFOAM from within CAESES®. See also the marine section for related content about propeller design.